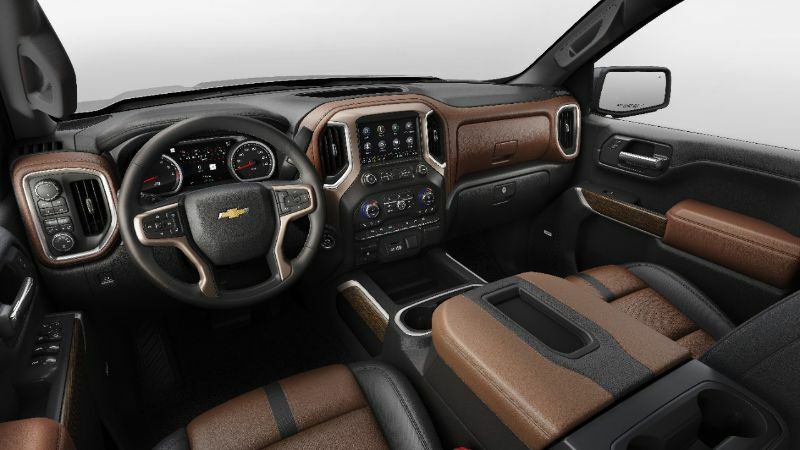 The 2019 Chevy Silverado LT All-Star Edition and includes plenty of updates for the latest generation of this Chevrolet pickup. Right from the start, you notice that the headlights on the Silverado are all-new and redesigned. Instead using the grille as a split, the fender comes under and with LED lighting. There is also a unique, sharp running light under the fender, with a turn signal underneath and the redesigned grille. This latest grille now has vents in the middle to improve airflow. The front bumper has redesigned styling with relocated fog lights, but the tow hooks have barely moved. 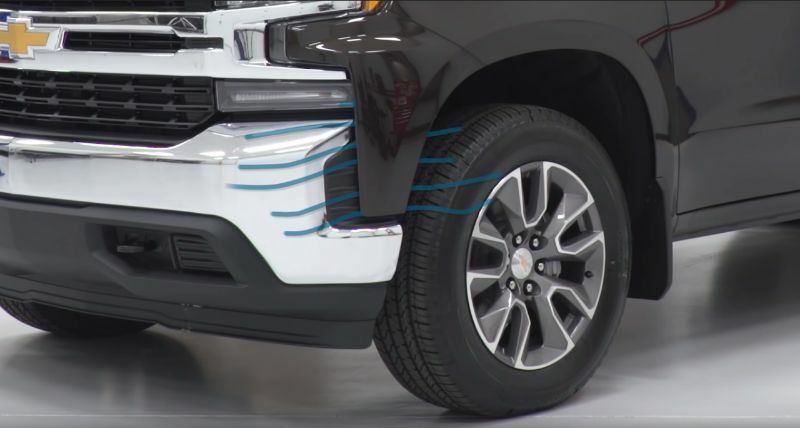 The Silverado retains its 8.9 inches of ground clearance thanks to the lower chin splitter. While this is fine for most drivers, it is something to consider if you plan on going off-road or to a work site. There are variations that improve the ground clearance for those who need it. The hood is a bit shorter as well as pushed back, looking sleeker than before. The new wheel-well design makes it possible to fit a 33-inch tire on the truck right out of the factory, something which was not previously possible. 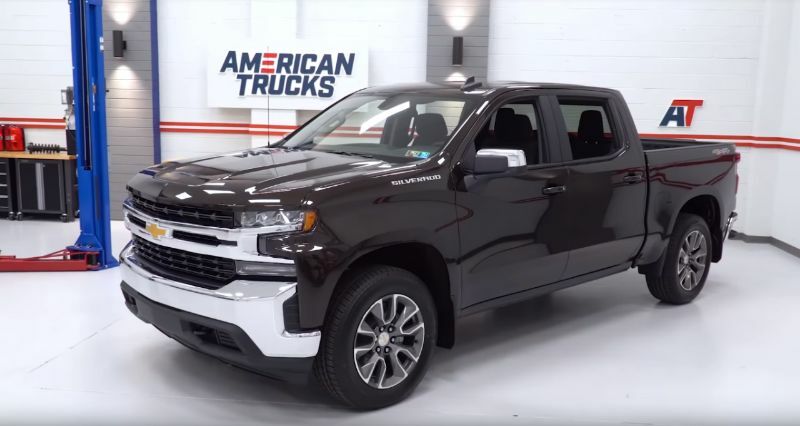 This latest 2019 Silverado has a great deal of weight savings thanks to the use of aluminum-steel and high-strength steel, which make up all the body panels. Swing panels like the doors and tailgate feature aluminum. There is steel on the roof, fenders, and side body panels for the truck bed. The result of all these weight-saving measures is a drop in weight of 450 pounds. The Silverado has the convenient keyless entry you expect from most modern autos. With the keys in your pocket, you can press the door handle to lock or unlock, a feature which is now conveniently on all four of the doors, letting passengers unlock it. Going to the bumper step, you will notice that it is taller and deeper, complete with tread for slip-resistance, making access easier. The taillights on the 2019 Silverado are both well-liked and receive plenty of criticism. They are incandescent instead of LEDs. 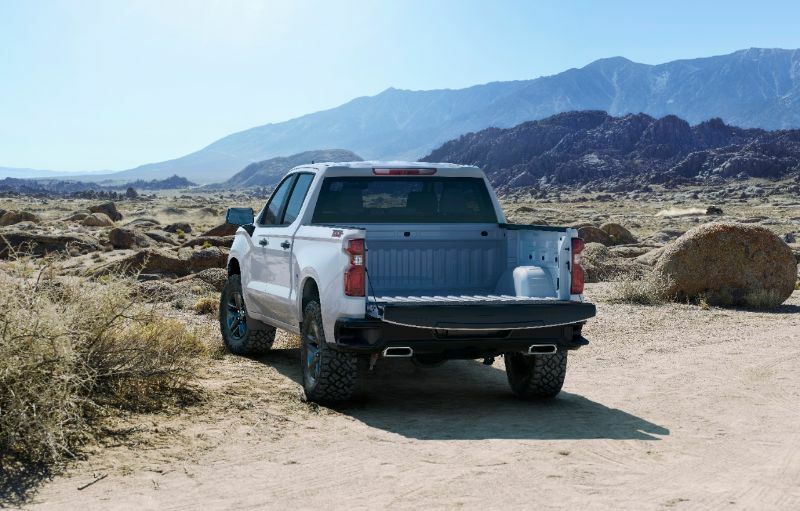 The tailgate itself has many additions, including the new embedding of the word “Chevrolet.” Now to open the tailgate, you press a button and take advantage of its assisted lowering. The bed itself is a DuraBed made from high-strength steel. There is additional surface area, from 53 cubic feet to 63 cubes over the previous generation. The bed sides are seven inches longer than before. There are also 12 different tie-downs, each rated for as much as 500 pounds. Factor in nine movable tie-downs and an optional power outlet. The steering wheel is slightly redesigned with an extra handle at the bottom and overall sleeker, sportier feeling. Some models feature a heated and leather-wrapped steering wheel and the wheel always has plenty of controls. To the left side of the steering wheel has more controls than before, with clear buttons, including a Terrain Mode button. The infotainment system is fully equipped with OnStar, Apple CarPlay, Android Auto, two modes for the backup camera, and more.